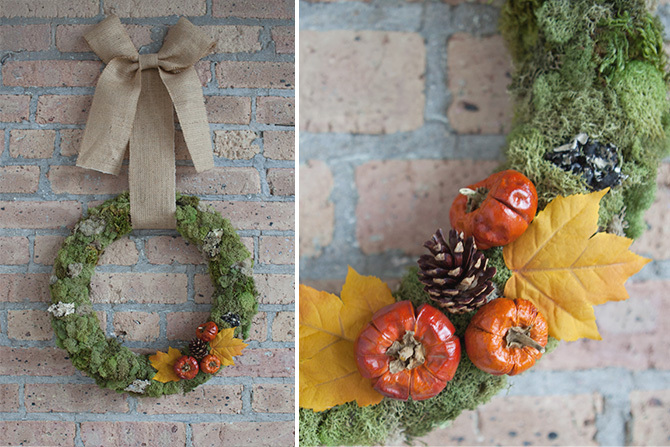 DIY: Moss-Covered Wreath | Evermore Paper Co.
1. Heat up the gun and begin gluing the moss to the wreath. I went at it without any rhyme or reason and also used several variations of moss. I also only covered the front and sides, making sure that none of the styrofoam was showing through. To add some depth, I occasionally glued some moss to other pieces of moss. 2. To create the bow, I formed the shape using 1 yard of burlap and instead of tying a knot, I secured the center using some floral wire. Then I trimmed a piece of burlap measuring 5 in. long and folded the sides inward to create a strip measuring approximately 5 x 1 inches. I then wrapped this piece around the center of the bow making sure to cover the wire completely and secured it in place using hot glue. 3. To create a hook to hang the wreath from, cut some more floral wire and thread it through the back of your bow underneath the piece that you just attached. Then twist the ends to form a loop. 4. Next, cut another piece of burlap and wrap it through the center of the wreath. Attach it to the back of your bow using hot glue. 5. Now add your decor. You can do this either using some more hot glue or for easy removal, I recommend using floral wire and tying each piece into place. And there you have it! Your wreath is ready to be put on display.